I am mad for "Follies." I was very excited to see the recent Chicago Shakes production, but still sad I couldn't get to Washington DC for the Kennedy Center production directed by Eric Schaeffer and starring Danny Burstein, Jan Maxwell, Bernadette Peters and Ron Raines. PS Classics and Executive Producer Tommy Krasker have provided a lasting record of that production with their new cast recording of "Follies" in all its musical glory. Krasker always sweats the details for PS Classics, ensuring a wonderful product. Or, as Mr. Sondheim himself said in an interview, "PS Classics does great work. It is always beautifully produced with them. Tommy Krasker is as good as they come and he loves musicals. All PS Classics albums are well-done." This one is a labor of love for Krasker, as noted on the PS Classics site. When it came to the opportunity to do a "Follies" on Broadway cast recording, Krasker "knew the kind of recording he wanted to make -- one that would speak to him, as a fan of the show, one that might convey the musical and dramatic qualities that, to his mind, make Follies a singular, irresistible theatrical experience." You know you're in good hands when someone says exactly what you think. "Singular and irresistible." Yep, that's "Follies." PS Classics describes the package they've put together for this cast recording as "an expansive two-disc set, complete with 52-page full-color booklet with essay, synopsis, lyrics, production photos and a brief note...from the album producer." That means lots of beautiful pictures of the performers and production numbers as well as every single thing you might think of including if you yourself were going to preserve the "Follies" experience. 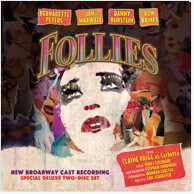 Like "Look, I Made a Hat," this cast recording of "Follies" is a must-have for Sondheim-o-philes. Or anyone who loves musicals, really. So, you know, ORDER TODAY. Enthusiastically seconded! I've been enjoying this for a week now, and it is indeed superbly produced. It's the first "Follies" recording to give an idea of the show's continuity and atmosphere, how it weaves in and out of the past. Everybody should own this recording of... oh, I'll come out and say it: my favorite musical ever.